I have never been to Vorarlberg, but from what I hear it is full of exciting attractions: People that nobody understands, mountains and more mountains. From what friends have told me, what I have read on Wikipedia and the official tourism website of Vorarlberg, there are also some real sights in places like Bregenz - or Feldkirch. It is a significant spot for through-faring traffic, mostly coming in by train form Germany and Switzerland and rushing on to Innsbruck, where people hope to find better reasons for proper sightseeing. However, going to Austria and missing Feldkirch is like going to London and missing Westminster subway station: not too much of a big deal, but once you are there, you will enjoy it. A village more than a town, Feldkirch has a long-standing history leading to the presence of a whole bunch of medieval buildings in the centre. 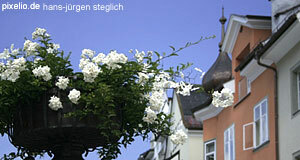 Stay around Neustadt and Marktgasse for the most pleasant array of medieval burgher houses. This part of the old town is outlaid in a grid of roads, a rare sight in a country that typically has bizarrely grown towns following rivers, bending around mountains and getting distorted along valleys. The city centre was fortified by the Habsburgs at the time of Emperor Maximilian I. Note the powerful Churgate and the Katzenturm ("Cat Tower", no idea why a cat should be intimidating). There is also a local castle, the Schattenburg, which hosts a reasonably interesting Heimatmuseum or Town Museum. It was the home of the counts of Montfort for approximately 200 years from the 12th century. The parish church of St Nikolaus is a Gothic church with supposedl interesting interiors, widely preserved from their 15th century origin. A particular attraction is the 1521 pieta by the locally born artist Wolf Huber and some refreshingly modern stained-glass windows from the 1960ies. If you are fluent in German, you are likely to be the only one in the village who is. However, say about the Vorarlbergians whatever you want, the one thing they are not is conservative in architectural style. The stained glass windows are only one example of many where these Alemannic mountain folks have shown an Avantgardistic approach to modern architecture. If you enjoy that and the contrast to the mountain scenery, you might want to move on to Bregenz, which is full of examples for the new "Vorarlberg School" of building. Otherwise, dive into the wilderness: The mountains surrounding Feldkirch are supposedly among the most scenic in Austria and the Bregenzerwald is a popular hiking region. During the winter season, it also makes a great starting point for skiing excursions.